Update: This concert will be simulcast on WPRK-FM Rollins College as part of the station’s Jazz In The Bible Belt radio show. Stream the concert here, here or at iTunes>Radio>College/University>WPRK-FM 91.5. This is a bookend to WPRK’s 60th Anniversary Fund-A-Thon and Concert event. Happy anniversary, baby. Much like our Harris Eisenstadt’s Canada Day and The Thirteenth Assembly concerts at Timucua white house, this event imports a collective assembled from bandleaders and composers. The name Endangered Blood won’t mean as much to most creative jazz fans as the components that make up the ensemble. We first saw EB bandleader, composer and reed player Chris Speed along with current bandmate/drummer Jim Black back in the late-ish 1990s when Tim Berne‘s Bloodcount quartet hit Jacksonville, Florida. Bloodcount- with the same two reed, double bass and drums array- seemed at war with a semi-indifferent audience, an unexpected opening act and falling parts from the lighting cans on the Moto Lounge stage. The resulting concert was far from a disaster. The members of Bloodcount counterattacked via Berne and Speed’s knotty reed play and propulsive, impolite rhythm section entreaties from Mike Formanek and Jim Black. We were sold on the idea of Bloodcount being one of the major, yet underrated new jazz ensembles of the decade. Forward to 2012. Speed has subsequently collaborated with Jim Black in Speed’s Yeah No and Pachora- both bands melding Middle Eastern melody along with other fusion elements. Tim Berne assembled and disassembled about as many bands as Miles Davis. You can think of Endangered Blood as a Frankenstein’s Monster assembled from some of Bloodcount’s body parts and/or as the ensemble of four bandleaders that we mentioned at the top of this missive. Endangered Blood are high school friends Chris Speed and Jim Black, joined by second reed player Oscar Noriega and bassist Trevor Dunn. 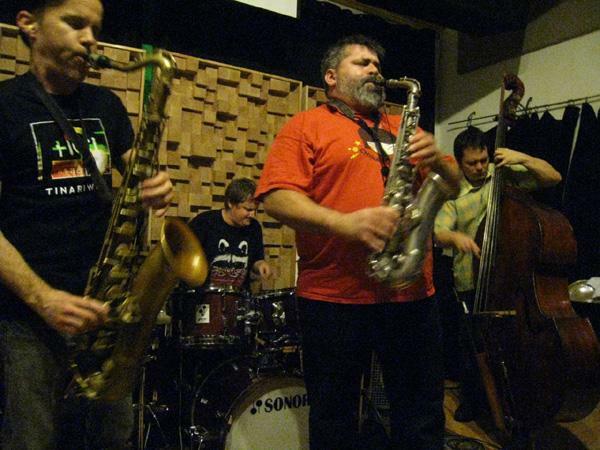 Noriega furthers the Tim Berne connection by having been busy touring in Berne’s Snakeoil following their highly touted first CD on ECM. Oscar Noriega‘s path to the New York City avant-garde seemed unlikely when he was back in Tuscon, Arizona performing at weddings as part of his brother act ranchera band. Stops in Los Angeles and Boston preceded a move to Brooklyn and his immersion in the somehow simultaneously incestuous, yet insular (not everyone gets invited to the swinging parties) Manhattan jazz scene. Bassist Trevor Dunn– while long a study of jazz, classical and experimental music- made his name in the underground rock scene after founding Mr. Bungle, receiving a Warner Bros. record deal and then getting the John Zorn Bump when the avant superstar produced their eponymous CD. Mr. Bungle’s three releases elicited a feverish fan following that Dunn continued to enjoy during his involvement in the related Fantômas project and their subsequent welding to the long-running smudge-metal of Seattle’s The Melvins. After the end of Mr. Bungle, Dunn moved from Southern California to the not-so SoCal Brooklyn. He has been a regular in the New York underground as a member of many groups, including Masada, Electric Masada, Nova Quartet and Dreamers- all from John Zorn‘s hyper-fertile concept farm- in addition to The Nels Cline Singers and his own Trio-Convulsant. The Dunn/Black rhythm section play post-post-bop (long on personal gestures, hinting at some tradition) while Speed and Noriega wind mercurial, serpentine reed lines around a compositional tether pole. This aggregation of bandleaders/composers will be in the U.S. East and Southeast, playing thirteen straight, blistering one-nighters, with the Timucua white house appearance serving as their only Florida appearance. Tags: Chris Speed, Civic Minded 5, cm5, Endangered Blood, Jim Black, Masada, Mr. Bungle, Oscar Noriega, The Melvins, Tim Berne, Timucua white house, Trevor Dunn. Bookmark the permalink.